This infographic by ReversePhoneLookup.org has some great data points – including the sobering stat that 16% of consumers who create passwords still use a person’s first name – but I especially like their 9 tips for staying secure online. Chances are you will be among the 90% of consumers who say they expect to shop for gifts online this year, a 1% increase over last year. You might even be among the 15% who are expected to purchase gifts through a mobile device [i]. In fact, 60% of smartphone or tablet owners plan to use their device for a range of holiday shopping purposes this year, according to a new report by Prosper Mobile Insights. This report indicates that among respondents saying they will use their mobile device for shopping this season, 60% expect to use their device as a “mobile mall,” with 56.7% primarily using their device to plan and research purchases, and one-third will use them to make at least 50% of their holiday purchases. Whether you are shopping for others or for yourself, knowing how to get a great deal takes a lot more than just looking at the price tag. Fortunately, learning 6 basic precautions will turn you into a savvy and much safer online shopper. Start with a secure internet environment. 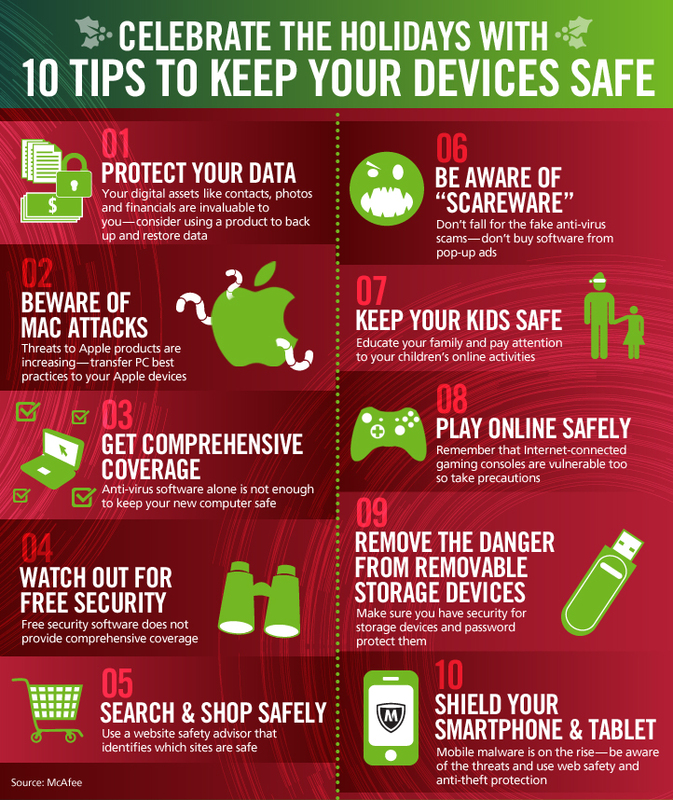 If your computer, tablet or cell phone isn’t protected from viruses and other malware your financial information and passwords will be stolen as you make purchases (as will everything else you store on your computer or do online). This concept is so basic, yet far less than half of the US population adequately protects their computers – and only 4% have security protection on their tablets or smartphones[ii]. You must have anti-virus and anti-spyware software installed and up-to-date. If your computer or phone isn’t protected from Trojans, viruses and other malware, your financial information, passwords and identity will be stolen. If the cost of security software is prohibitive, at least use one of the free services available – just search on ‘best free antivirus’, and ‘best free mobile antivirus’ to see your options. If you don’t think you need mobile security software consider this; BullGuard security identified 2,500 different types of mobile malware in 2010[iii]. Secure your internet connection. Make sure your computer’s firewall is on. If you use a wireless network it needs to be encrypted so someone who is lurking outside the house can’t collect your information. If you need a free firewall, search for ‘best free firewall’. Never use a public WiFi service for any type of financial transaction or other type of sensitive information transfer. Identify trustworthy companies. You need to either know the company – or know their reputation. If you already know the store, shopping their online store is very safe. If there’s a problem you can always walk into the local store for help. If you already know the online store’s reputation you will also be very safe. If you don’t know the store, it may still be the best option; you just need to take a few more steps. Search online for reviews from other users to see what their experiences were with the company, and conduct a background check by looking at sites that review e-stores (for example, Epinions, BizRate, Better Business Bureau). If the store isn’t listed as a legitimate site by one of these sources, or the store has a lot of negative reviews, DON’T SHOP THERE. It’s that easy. Know how to avoid scams. The holiday season is primetime for email and web scammers because they know millions of people will be spending billions of dollars online. To give you a sense of just how much money changes hands, last December (2010), $32.6 Billion dollars were spent on internet shopping sites[iv]. The best way to avoid scams is simple. NEVER, ever, click on a link in an email or on website advertisement no matter how reputable the host website or email sender may be. The website ad or email may be a really good fake, or the website or email account may have been hijacked by spammers. Instead, use a search engine and find the deal or store yourself – if you can’t find the deal on the legitimate store’s site you know that ‘offer’ was a scam. Click here to learn more about identifying scams. Protect personal information. Many ecommerce and mobile commerce sites encourage you to create a user account, but unless you truly plan to shop there often you’ll be better off not doing so. If you do choose to create a profile, do not let the store keep your financial information on file. All you really need to purchase something should be your name, mailing address, and your payment information. If the merchant asks for more information – like your bank account, social security, or driver’s license numbers, NEVER provide these. Some reputable companies will ask additional questions about your interests, but these should always be optional and you should be cautious about providing responses. Keep in mind that the company may not have strong security measures in place. The lack of strong security precautions in many companies is a real concern. Huge companies like Sony have been hacked multiple times and consumer’s passwords, names and financial information has been stolen. And unfortunately, many smaller businesses have even fewer safeguards in place to protect your data – so give them as little as possible! To learn more about these risks, see Small Business Owners Suffer from False Sense of Cyber Security. Make payments safely using a credit card or well respected payment service. Credit card purchases limit your liability to no more than $50 of unauthorized charges if your financial information is stolen, and the money in your bank account is untouched. Most debit cards do not offer this protection – and even when they do, you’re the one out of funds in the meantime. However, you probably don’t have a credit card, so striking a deal with a parent or guardian to put the charges on their card – with you handing them the cash – may be a good option. Or, you can use a payment service like PayPal that hides your financial information from the online store and can be set up to take money out of your bank account. Do not use checks, cashier’s checks, wire transfers, or money orders as these carry high risks for fraud. Do your research. Just because a store claims to have the lowest price, doesn’t mean they actually have the best deal. Comparing the advertised price of an item doesn’t give you the full picture. You have to look at the final price – that includes any shipping, handling or taxes to see which deal may be really be the better bargain. Some companies show lower prices, but make up the discount by charging high shipping fees. Check the company’s return policy. Some companies charge fairly steep return fees for shipping and restocking, so if you think the item may be returned factor this into the price as well. Look for online coupons or discounts. Lots of stores offer special deals if you just take the time to look for them. Typing the store’s name and ‘coupon’ is usually all it takes to discover whether extra discounts may apply. No matter how great the ‘deal’ if you can’t afford it or it’s over your budget, it isn’t a deal. Learning financial responsibility now will set you up for financial security for the rest of your lives. And in spite of all the glittery ads, many of the best gifts don’t cost money. “If every [business] knew their money was at risk [from online fraud] in small and medium-sized banks, they would move their accounts to JPMorgan Chase,” said James Woodhill, a venture capitalist who is leading an effort to get smaller banks to upgrade anti-fraud security for their online banking programs. “That’s because JPMorgan Chase is the only major U.S. bank that insures commercial deposits against the type of hacking that plagues smaller banks. There is an excellent article in BusinessWeek titled Hackers Take $1 Billion a Year as Banks Blame Their Clients that is a must read piece. It provides a clear explanation of the insurance loophole that is wiping out businesses, school districts, churches, and local governments bank accounts, when and how cybercriminals strike; why small banks aren’t stepping up, why law enforcement is struggling to deal with the issue; the role of malware in these exploits, and what led to the creation of the yourmoneyisnotsafeinthebank.org website. You’ve taken down the decorations, found space for all the new ‘stuff’, and created your New Year’s resolutions… but wait! Before you put the holidays behind you, closely review your credit card statements to be sure the charges you see are charges you made. By all accounts, online holiday spending hit new highs. According to data from comScore the November – December 2010 holiday season reached a record $32.6 billion in spending, marking a 12% increase over the $29 billion spent in the 2009 holiday season. Spending was so high on Cyber Monday (Monday, Nov. 29) at almost $1.03 Billion that it stands as the single heaviest online spending day of 2010 billion, and it shattered previous records to become the single greatest spending day on record. Crooks are making a list, and checking it twice…..
With all that money flowing through all those websites via all those unprotected computers, cyberthieves have surely had a heyday. And if you aren’t paying close attention to the charges on your credit card statements, you may have given one ‘gift’ more than you intended. If there are fraudulent charges, make sure you check your credit scores as well. Under the Fair Credit Reporting Act, you have the right to one free credit disclosure in every 12-month period from each of the three national credit reporting companies—TransUnion, Experian, and Equifax. Request a free credit report from one of the three companies for yourself, your spouse, and any minors over the age of 13 living at home to check for credit fraud or inaccuracies that could put you at financial risk. (Although exact figures are difficult to get, the latest data shows that at least 7 percent of identity theft targets the identities of children.) The easiest way to do this is through AnnualCreditReport.com. You can also pay for credit monitoring services that will alert you to any suspicious activity or changes in your credit scores. Online Shopping Sets New Records – But Are You Safe When Buying Online? Black Friday and Cyber Monday saw record breaking increases in consumer spending. Shoppers spent $648 million in online sales on Black Friday, and a whopping $1.028 billion on Cyber Monday representing an increase of 16% over last year. Online spending was so strong, that Cyber Monday actually set two new records: it was the heaviest online spending day in history, and the first to surpass the billion-dollar threshold, according to comScore data. How safe are YOU when shopping online? Whenever large amounts of money are changing hands, criminals line up to siphon off as much as possible from unprotected and/or unsuspecting buyers. A few simple precautions will help keep you from being grinched by crooks this holiday season. 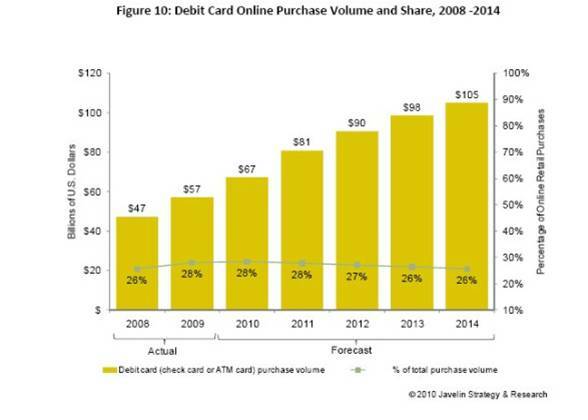 Debit cards are rapidly growing in popularity according to a new study by Javelin Strategy & Research. While 70% of consumers used a credit card to make purchases in 2009, 51% used a payment service like PayPal and a surprising 55% used debit cards – which potentially carry significantly higher risks as debit cards do not provide the inherent protection that credit cards carry. 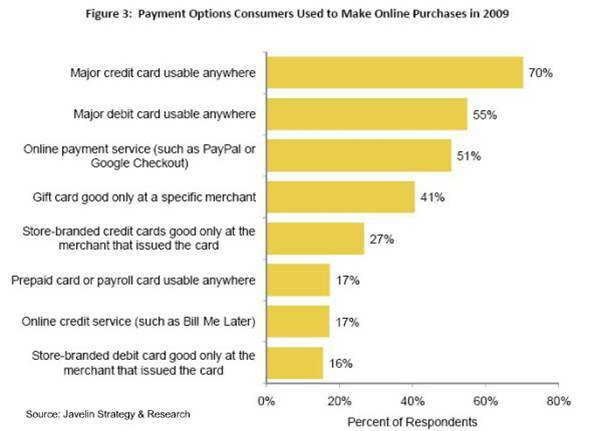 Online users largely unaware of the increased risks of using debit cards for purchases. When using a credit card, you are using an extension of credit from the bank. The most you can be liable for is $50 if it is fraudulently used. If the card is stolen or abused, it is the bank’s money was stolen – it did not come out of your checking account. Stolen or abused debit cards on the other hand, charge or debit your account at the moment of the transaction – and getting it back is far from guaranteed. According to the Electronic Funds Transfer Act, notification of the theft of your debit card (or your debit card number and PIN) is given within two business days of discovery of the loss or theft, you may only be liable for $50. If you do not notify them within the two-day limit, you could lose up to $500. The kicker is that you may not know within two days that abuse has occurred – do you check and reconcile your account balance daily? Finally, If you don’t report any unauthorized transaction that appears on your statement within 60 days of receiving it, you risk unlimited loss on transfers made after the 60-day period. The result can be that you lose all the money in your account plus your maximum overdraft if you have one. In spite of the increased risks, the study reports that debit card purchase volume rose 21.3% between 2008 and 2009, equaling a jump from $47 billion to $57 billion USD, and debit card purchase volume is expected to increase 42.5% to $67 billion by the end of 2010. Looking at projections for 2014, debit card purchase volume is expected to grow 123.4% from its 2008 level to $105 billion USD. There are a variety of ways in which debit card numbers and PINs can be stolen online. If your computer is infected with malware, you may be the one providing this information to thieves directly. If the site you purchase from is unethical, or one of the workers in that company is a thief, it may be stolen as part of your transaction. Or, if the ecommerce site is hacked, your debit card information can be stolen by the hackers. In some attacks, millions of credit and debit card numbers have been stolen in single hacking incidents. For the credit card users, this can represent a real hassle – and a $50 loss. For the debit card users, the financial impact can be devastating. The safest course is to use a credit card, or a Payment Service for online transactions. Should you choose to use your debit card, check with your bank to understand exactly what protections they afford – some banks do provide better protections for their debit card holders than the law requires. Then, vigilantly monitor your account for unauthorized activity so that you can report any problems within the required reporting windows.